25% OFF STORE WIDE Offer Ends Tuesday November 27th, 2018. 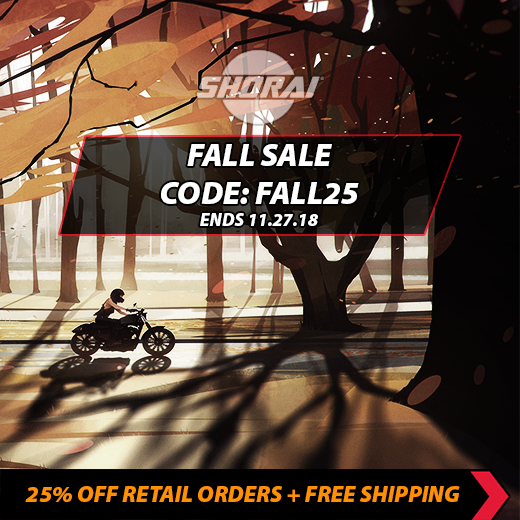 Save 25% OFF your regular retail order with the Shorai fall sale. Pick Free Standard Shipping Shipping. You may need to create an account if do not have one. *Promotion ENDS Tuesday November 27th, 2018 and is only valid with purchases made directly from Shorai. Promotion only applies to sales made in the United States. This Offer is only valid for new and returning customers. Dealers and distributors are excluded from this offer. Back ordered items are expected to ship in approximately one week from the order date.